WE’RE STILL A few weeks out from summer, but the weather is about to move in the right direction as temperatures hit the low twenties this Easter weekend. According to Met Éireann, the mercury will rise from tomorrow before hitting 21 degrees Celsius in parts of the country on Friday and Saturday. Today will see dry conditions with bright spells and temperatures of 13 to 16 Celsius generally, although there is expected to be a few spots of drizzle in parts later tonight. However, dry conditions will continue tomorrow as sunny intervals and warmer weather develop, particularly in the western half of the country. Maximum temperatures will reach between 13 and 19 degrees Celsius on Thursday, before even better conditions develop heading into Easter weekend. 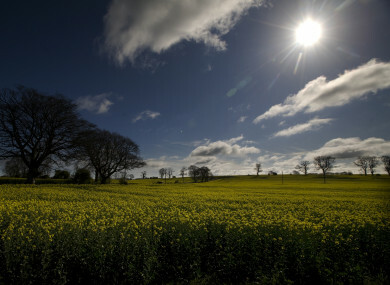 Good Friday will be dry and see long spells of spring sunshine with top temperatures of 17 to 21 degrees, although it will be a bit cooler in the east and south of the country. The forecaster says it will be dry on Friday night with thickening cloud in the west and northwest, as temperatures dip to between 6 and 10 degrees Celsius with some patchy breezes. Saturday will be another warm and mostly dry day with long spells of hazy spring sunshine expected throughout much of Leinster and Munster. Cloud will begin to develop in northern and western counties as the day continues, however, when some patchy rain and drizzle will appear by the end of the day. Top temperatures on Saturday will be between 16 and 21 degrees, although it will be a few degrees cooler under cloud in parts of west and northwest once again. Patchy light rain and drizzle will extend southeastwards over the country on Saturday night, when there will be lows of 5 to 8 degrees in the west and north and 9 to 11 degrees further south and east. The bad news is that changeable, unsettled conditions will return on Easter Sunday when patchy rain or drizzle develop in parts, although there will also be some dry periods across the country. Maximum temperatures will drop to between 13 and 16 degrees Celsius, before rain is predicted to cover the country from the Atlantic on Sunday night and daytime temperatures drop again on Monday. Email “Good Friday in store as temperatures expected to hit 21 degrees over Easter weekend”. Feedback on “Good Friday in store as temperatures expected to hit 21 degrees over Easter weekend”.